Change is hard. Changing culture is even harder. Adopting Agile and Scrum requires a change of culture. Many organizations and Teams have made many Agile and Scrum implementation mistakes during this transition. By reading this book, you will be standing on the shoulders of those who failed before you. What are the biggest mistakes made in enterprise Agile adoption? Common enterprise Agile adoption anti-patterns and how to avoid the pitfalls. How do companies stifle Agility by planning and running projects in counterproductive ways? Common project and programme setup anti-patterns and how to avoid the pitfalls. How and why do teams fail to embrace Agility? Common Agile teams anti-patterns and how to avoid the pitfalls. How do Product Owners fail to play their crucial part in making Agile a success? What are some of the Product Owner mistakes. How some Scrum Masters constrain Agility instead of becoming agents of change? What are common Scrum Master ant-patterns to watch out for. 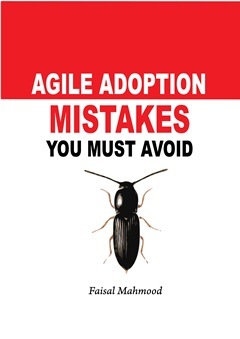 Drawing important lessons from common failures and mistake is the goal of ‘Agile Adoption Mistake You Must Avoid’. Accelright is registered in England, number 7382926. © 2012 Copyright Accelright Limited.